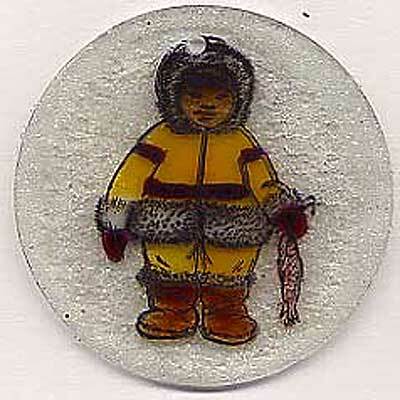 “Eskimo Child” is stamped with black Crafter’s ink and heat set on a clean round glass shape (available at local craft stores) making sure to heat it until no wet ink can be seen and being careful while handling the glass as it is HOT. Gallery Glass was colored on the side opposite where it was stamped. It was turned occasionally to be able to see where to add more Gallery Glass. When dry, a thin layer of Perm Enamel (found in the glass paints sections) was added to the back. Next, tiny clear glass beads were added and it was left to dry. In order to ensure that the beads won’t come off, another layer of Perm Enamel was applied and left to dry. On the front, a line of Perm Enamel was painted along the edge, beads added and it was left to dry. A thin coat of Perm Enamel was added to the entire front to protect the stamped ink from being scratched off. Sun catcher by Wendy Kerr.